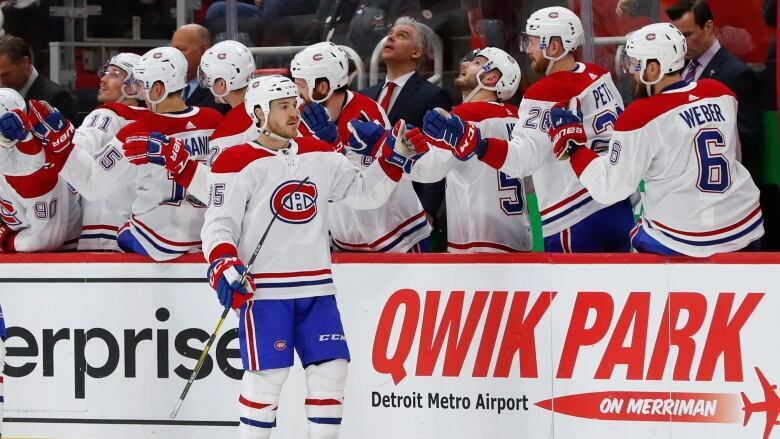 Andrew Shaw recorded his first career hat trick and Max Domi had two goals and three assists for a career-high five points as the Montreal Canadiens routed the Detroit Red Wings 8-1 Tuesday night. Reuniting linemates worked out for the Montreal Canadiens. "It was great to be back out there with Max and Dru [Drouin] again. We've played together before with good success, and it obviously felt good for us again tonight," Shaw said. "Everything that I did tonight was because of them. I was trying to get into good situations and they kept getting me the puck." Tomas Tatar, Brendan Gallagher, and Joel Armia also scored for Montreal. Defenceman Jordie Benn added two assists and Carey Price made 28 saves. "I thought the key was that we never took any time off," Domi said. "We got the early lead thanks to Tats [Tatar], and then we were ready to go again at the start of the second and third periods." "I'm not sure what happened. It went in our net too easy, but not from a goaltending perspective. We gave up stupid chances out of nowhere and they were in the net," Red Wings coach Jeff Blashill said. "When you don't play great defense, you have no chance because you are always digging the puck out of your net." Defenceman Madison Bowey made his debut with Detroit after being obtained in a trade that sent defenceman Nick Jensen to the defending Stanley Cup champion Washington Capitals on Friday. Tatar, a former Red Wing, opened the scoring 6:16 in. He fought off Detroit rookie defenceman Filip Hronek to get to a bouncing puck for a partial breakaway and beat Howard with a forehand shot for his 22nd goal. Mantha spoiled Price's shutout bid with his 16th goal with 1:44 remaining in the middle period. "I've had a few two-goal games, but I've never gotten that third one," Shaw said. "So that felt great."